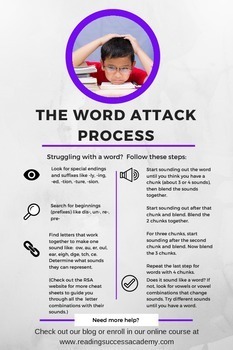 Reading Success Academy's Word Attack Process is a tool for struggling readers who are familiar with the Phono-graphix method for teaching reading. This infographic reminds students of the steps they need to go through to work through long and challenging words. Having a process for attacking unfamiliar words is a deterrent for guessing and builds student self confidence.